Teos (or Teo) was a maritime city of Ionia, on a peninsula between Chytrium and Myonnesus, colonized by Orchomenian Minyans, Ionians, and Boeotians. 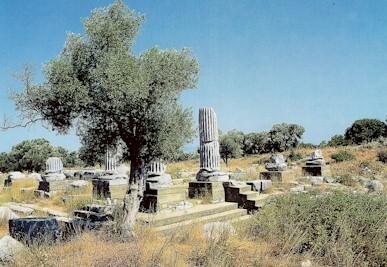 Teos was one of the most important cities of Ionia in antiquity. It was the birthplace of Anacreon the poet, Hecateus the historian, Protagoras the sophist, Scythinus the poet, Andron the geographer, and Apellicon, the preserver of the works of Aristotle. Teos was a flourishing sea-port with two fine harbours until Cyrus the Great invaded Lydia and Ionia (ca. 540 BC). The Teans found it prudent to retire overseas, to the newly founded colonies of Abdera in Thrace and Phanagoria on the Asian side of the Cimmerian Bosporus. Having lost its former importance, Teos ranked among twelve cities comprising the Ioanian League. 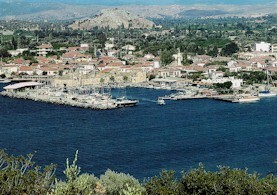 The port was revived by Antigonus Cyclops; and Epicurus reportedly studied there under a disciple of Democritus. During the times of the Roman emperors, the town was noted for its wine and the temple of Dionysius. The modern city of S��ac�k is situated close to the ruins of Teos. The temple of Dionysos is to be considered as one of the important buildings of antiquity accounted by Vitrivius in his Ten Books on Architecture (III.3.6-8, IV 3.1). The podium of the temple and the platforms of the temenos area were formed by shaving and levelling of the natural hill. The raised platform of temenos is of 1.5 metres in height. The temple and its altar to the east are centrally located within the temenos, and a paved platform joins the temple to the altar to form an architectural unit. The level of the temenos area is higher to the west and it is terraced towards the east by a series of steps. Rubble intermixed with reused blocks containing hellenistic mouldings formed the foundation under these steps. The remnants of the temple was a hexastyle peripteros with eleven columns on the sides agreeing with Vitrivius' account. The new research at the temple brought the possibility that it may be prostylos constructed on a stylobate of 8.10 x 19.3 metres. The length of the pronaos was 2.10 metres, cella 9.5 metres and opisthodomos 2.10 metres. The proportions of the pronaos, cella and opisthodomos parallels to the temple of Athena at Priene, Magnesia Zeus Sosipolis. However the depth of the opisthodomos is so narrow that could be the tetrastyle-amphiprostylos that was suggested by Dr. Mustafa Uz. There is evidence for an Archaic temple prior to the Hellenistic one. The measurements of the cella in 38.46 x 7.30 metres similars to the temple of Samian Heraion hekatompedos in proportion of 1:5. The remains of superstructure of this earlier temple in white marble with narrow egg-and-dart reliefs were found at the southwest of the temenos. Teos Hekatompedos temple was built by levelling the bedrock and filling the area over 3 metres on one side. Sea Wall, c. early III. century B.C. The remnants of the superstructure of the temple at the north terrace of the Agora showed that the columns were in composite syle mixing the Ionian and Attic elements. The architrave was in three bands or fasciae formed by egg-and-dart and Ionic cymation showing similarities to the Magnesian Zeus Sosipolis temple. The placement and proportion of the columns are in relation with the earlier works of Hellenistic architect Hermogenes which also supported by the epigraphical evidences that the temple was in fact built in the Hellenistic period. The archaeological surveys of the theatre and the bouleterion were completed. 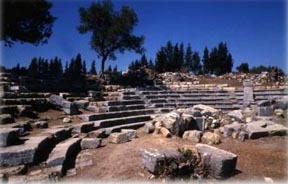 The theatre locates at the southeast of the Kocak�r Hill, it was built on a natural hill. Few additions to the original construction were made in the Roman period under Hadrian. The cavea of the building is well-preserved to a height of 15 metres. The bouleterion is at the north corner of the Agora. It lies 4-5 metres above the bedrock, 3 metres thick fill was used for terracing wall of the building. 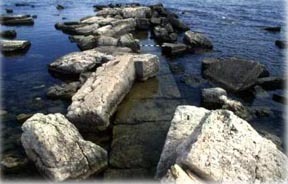 One of the important areas of research was the breakwater at the Southern Harbour. It stretches out to 200 metres along the east-west direction which is one of the survived early example of West Anatolian harbours. The wall construction technique of the breakwater similars to the city wall, an epigraphical evidence related to the construction of the city wall dates the wall to the 2nd century BC, therefore the breakwater could be contemporary. The surveys at the inner part of the city wall has revealed accumulated fills related to the ceramic production. The fills at the western part of Southern Harbour expand approximately 2 hectares area. Another one more limited is at the eastern section of the agora along the antique harbour area.